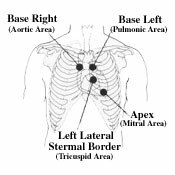 Left Lateral Sternal Border (LLSB)-the fourth intercostal space to the left of the sternum. Tricuspid and right heart sounds are heard best in this area. Apex-the fifth intercostal space in the midclavicular line. Mitral and left heart sounds are heard best in this area. 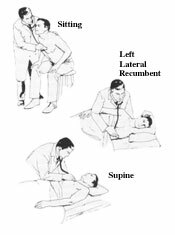 Base Right-second intercostal space to the right of the sternum. Sounds from the aortic valve are best heard here. Base Left-second intercostal space to the left of the sternum. Sounds from the pulmonic valve are best heard here. The sequence listed above is only one of the many acceptable ones. The important point is that the four areas mentioned be auscultated each time in a consistent manner, and that each area be assessed for sounds of both low and high frequencies. You are now ready to begin listening to the various heart sounds. When you hear each sound, keep in mind the various characteristics of sound and the fundamental procedures used in listening to the heart. Techniques: Learn how to get the best acoustical performance from your stethoscope. History of Stethoscopes: Learn the history of one of the most valuable diagnostic instructions in the history of medicine. Stethoscope Anatomy: Dissect one of our most popular stethoscopes and learn the significance of each piece. Short vs. Long Tubing: Determine the tubing length that is right for you. Differences in Acoustics: Discover what variables contribute to acoustical response.